When I heard about Expack I got so excited. Don’t get me wrong, Irish food is amazing. The meat and dairy here are unreal. However… you miss the stuff you grew up with. I signed up for the Canada Demi. Definitely the best thing in the box. I got almond and toffee ones. These things are amazing, but I’m going to tell Adam they’re disgusting so I don’t have to share. These are lemon zest shortbread? I’ve never heard of this company, but it looks like they’re Ontario based. I’ve never had these, but like, I’m not going to say no to a shortbread cookie. AKA deliciously seasoned shreddies and cheerios with obstacles. Don’t get me wrong, I love me some Old Dutch, I just find it strange that in a Canadian box they wouldn’t put ketchup chips. However, the Irish only do “lightly salted” chips and they just aren’t salted enough, so I’m into these. Okay, before we get into this let me be clear: I love fuzzy peach’s. They’re one of my favourite candies. However, I would have preferred one pack of them and a pack of something else. Overall I’m okay with this expack… I mean, it’s nothing overwhelmingly amazing. I’m super happy about the OMG’s but the two packs of fuzzy peach just confuse me. I’m going to give it another month because, well, I’ve already paid for another month and because this might be a fluke? Is it a fluke? Did you get one? Is it very different? I’m embarrassed to say the lack of electricity shocked me. I was in Italy and had already been flabbergasted by the superstition that wifi had to be turned off when it rained. We were going to my host family’s house at the top of one of the mountains that cradled Storo, a small town in Trento. As we drove along a one-way, curvy road the children in the car pointed out trees of significance, the best places to play, where the road closes in the winter. Later, they told me the car rattling was us driving over pine cones. It made the ride back into town slightly less terrifying. I watched as the children helped their grandparents and parents cut down a tree. I offered to help but was told guests should relax. As I took in them working, the dance they created, I realised my “relaxation” was simply a tactic to get me out of the way. He steps forward, she steps back, the trunk moves, they sway behind it, one moves left, one goes right… Eventually, I was deemed competent enough to try something and was handed a tool. After a quick lesson, I clumsily shaved pines off bigger branches. The smell of cheese being cooked brought us indoors to eat. The outdoor oven’s smoke mingled with the fat from salami. The table was complete with beef simmered in tomatoes and porcini mushrooms cooked in cream. Polenta soaked up every bit of sauce. There was an almost overwhelming heaviness in the house. The feeling that you weren’t just a part of now, but part of everything that had happened there. After dinner, I was assigned the job of putting mushroom stems under the tree. The stems would eventually root and grow, hopefully before the snowfall. Everything, it seemed, had been here and returned to here. I walked to the edge of the fence and peered out at the town below. How strange it must have been to watch the valley turn from green pastures to buildings and squares. The air was crisp, holding its breath in anticipation of the seasons turning. Dusk was rolling in, it was almost time to go back to town. As we drove into town, I wondered if I could live there. Up on the mountain, just myself and whatever I could come up with to occupy my time. A part of me likes to believe I could. I would read books and write every day. I’d go on walks and become intimately acquainted with every blade of grass, every trill the wind made. My sigh of relief when I saw my phone come back into service reminded me of why seclusion was something to work towards. Maybe I’m not ready to leave what I know quite yet. Dairy substitutes are super popular. We seem to be in this weird time where people love to cut stuff out of their diet. I don’t make almond milk because I’m lactose intolerant, or because I’m waging some type of protest on dairy. The human body is amazingly complicated in its diversity. Dairy works fine for me, so my reason for almond milk isn’t about digestion. No, I make almond milk for one reason only. My dad drinks straight from the milk bottle and it grosses me out. I mean, yes, it’s nice for a change and such, but I only make it when I catch him swigging, so there you go. You can really make this with any nut. I’ve heard macadamia, while expensive, is delicious. I’m thinking of trying walnut, but I like the subtlety of almonds. They don’t overpower. 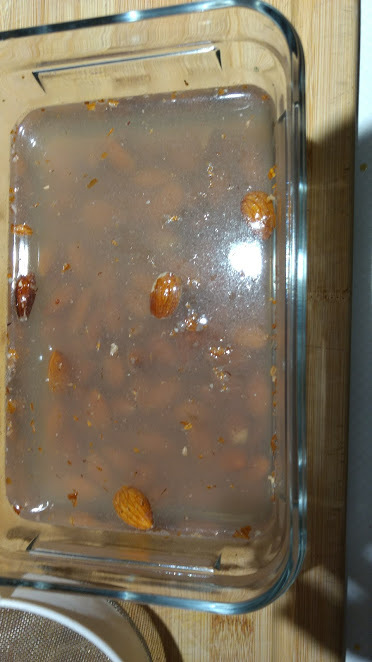 Start by soaking your almonds overnight. I used one cup of almonds. This makes them easier to blend. Just add enough water to cover. 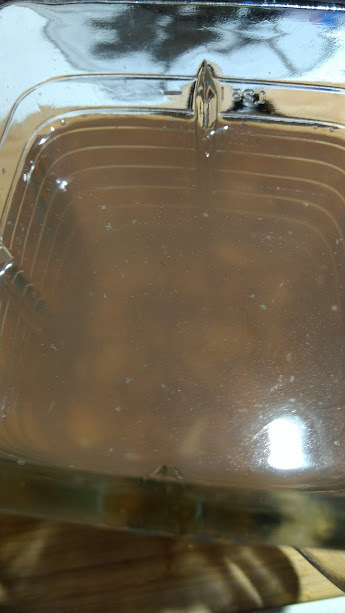 Then add your strained almonds and water- I used 4 cups- to a blender. and liquefy. Set up your straining apparatus. 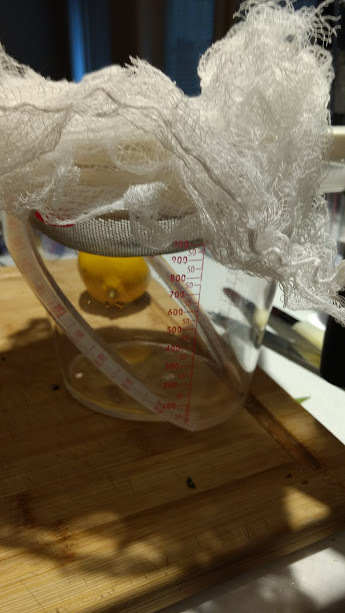 You can get special nut bags, but I just use a fine strainer with 4 layers of cheesecloth. Now, milk is naturally nuanced with a lot of sweetness and saltiness. I always add a bit of salt. Sometimes I’ll add a touch of agave or honey, sometimes a hint of vanilla. It really depends on what I’m using it for. Now, this isn’t a cheap project. 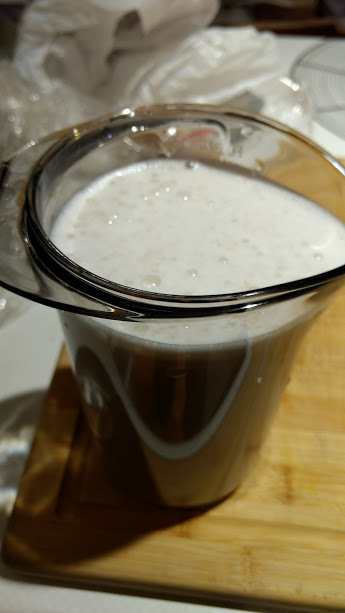 But, if you drink nut milk…. I mean, the ingredients list is insane. And I know my dad won’t touch it. There’s a lot of weird things going on. I’ve switched to writing full time. We all have a friend that shared that “you don’t quit jobs, you quit managers” meme, and that’s what I had to do, so it’s done. Now, how does that work with my current blog setup? this blog that I’m terrible at updating. my diy blog that I’m even more terrible at updating. I love this blog. I started it a long while ago and I’ve been trying to get it to just right to start a professional career but the problem is… I don’t want to be professional on here. I love that I can talk politics and be conversational and write short things and not have to worry about SEO crap and i can swear and I can write things like the longest run on sentence ever. It’s kind of gotten to the point where I know I need to write something serious, but I want to write something a little more off topic so I get in this weird shame spiral for wanting to be casual and end up doing nothing. So, where does that leave me? I’m keeping this blog. I’m attached. However, the direction will change a bit. I’m keeping this as my… not scratchpad, but more journal like. Since I want to be able to work on stuff here while I travel I’ve also decided to not monetize this blog. This entire fruition kind of came out of me trying to figure out if I can actually write an article while in another country on a tourist visa. I basically wanted to know if I needed a work visa if I planned to write things about my trip. Apparently I can do things and be paid to write about the experience later, but I can’t actually do paid writing. By separating the paid from the unpaid I’m giving myself a space to talk about whatever whenever. It’s kind of freeing to know that there’s just space here where I can work out stuff while I’m not working on stuff. But, things do sometimes need to be refined, and such things will go on my new launch, Third Name Sandy. It’s not nearly even close to done- I’m not sure I’m even keeping the layout… I’m probably not keeping the layout. If you want some refined stuff that’s taken me literal hours to write, stuff that’s more narrative and structured, then be prepared because it’s all coming as soon as I can write it. Which is sooner now because this is going to be my actual, literal job… which is kind of scary as hell. But still read this! Like I said, I love this blog and I want to update it more now that I have time. Last month I wrote about how to pick out what you like in art. That was super easy for me because I love Goya. To be fair, I love most art. Sometimes there’s very important pieces of art. For instance, Duchamp’s Fountain. The year was 1917 and basically Duchamp wanted to prove anything is art, so he tried to enter a urinal to the Paris art shows. The fancy people were all like, “um, that’s not even signed, get it together.” (not a direct quote) and so he signed it, titled it fountain and got it into the show. This was a major catalyst to a whole new movement called Dada that basically is all about nonsense, but good nonsense. You can read about it in academic terms here if you’re so inclined, and you should be inclined. Now, if you feel that that explanation is heavily biased, then congratulations you are right.